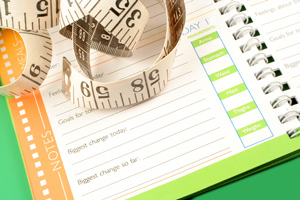 Monitoring what you eat is absolutely essential if you want to stick to your diet. Although calorie counting is not required on most low carb diets, you will probably need to count the amount of carbohydrate consumed. In any case, making a note of everything you eat is vital for success. If you don’t write it down, you will probably vastly underestimate the amount you eat, including the amount of carbs. Your own brain will try to fool you if you are not careful! Having a record can help you analyse if there are any problem areas – for example, if you tend to overeat at dinner. Knowing you have to write it all down actually helps self-discipline – you might be less inclined to deviate from the plan if you have to record that deviation – even if the only person checking the record is yourself. It may seem like a very tedious task at first, but in reality, it gets easy very quickly. Most of us tend to have a range of 20-30 foods we would usually consume – once you have the specs for these foods in your system, you won’t have to keep looking up carb content every time you put something in your mouth. It is also a good idea to keep a diary of all exercise you do. This will help you monitor your progress, and allow you to increase the intensity gradually (aim for no more than 10% a week) – constantly pushing yourself out of your comfort zone, but doing it gradually and in small increments, to avoid getting injured or over-training. You also need to keep looking at “the big picture” of your progress overall – how well are you doing on a weekly and daily basis. A wallchart can be very useful – print out a calendar for two weeks or a month, and mark up successful and unsuccessful days. This will help to motivate you, and will provide an objective picture of how well you are progressing. Our senses can be very misleading in this respect – you might feel disheartened if you are not losing weight, but your chart will highlight the reasons for that – perhaps you’ve been neglecting your exercise, or not sticking to the plan as well as you should.